Location and Access: 21806 94A Avenue. Formal trails along southern and western portion of the natural area; sidewalk along east of wetland; Secord Park to the northeast of the wetland. 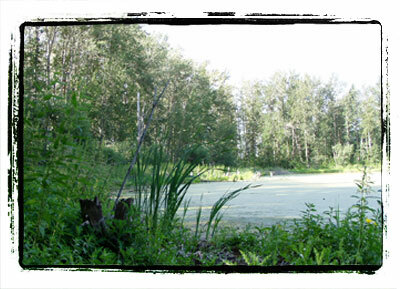 The Secord Wetland natural area consists of a wetland surrounded by an upland forest dominated by balsam poplar. This natural area is a remnant patch of the formerly larger Winterburn School natural area. The presence of both a treed upland area and a low-lying wetland allows for some different functions and values that would not exist if only one of the two features was present. These additional functions include providing habitat for animals that require elements of both wetlands and forests, such as goldeneye ducks and frogs. The complex also acts as a buffer and a filter that stabilizes the wetland. The wetland portion of this site includes a permanent water body that is sustained by inputs from the stormwater system via three sediment forebays that ensure the health of the wetland is not impacted by urban water sources. The upland area surrounding the wetland provides excellent habitat for a multitude of bird species and cover and food for many other animal groups, while the well-developed understory vegetation throughout the forested area provides further diversity. A formal trail along the southern portion of the natural area allows access through the upland area with views of the wetland. Location and Access: 9804 Winterburn Road. Access limited to the periphery of the natural area via paved trails, and from a park to the south. Parking available on local roads. The Secord Treestand is a remnant patch of deciduous forest located west of Winterburn Road and slightly north of Winterburn School. 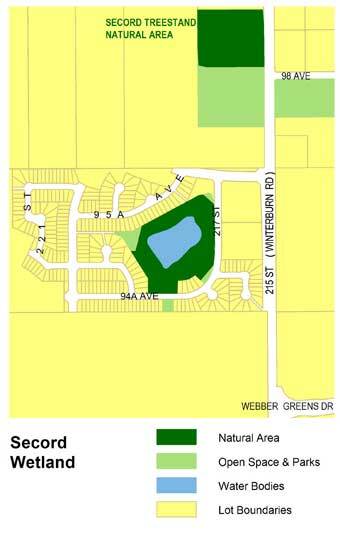 Two baseball diamonds are located on the park space directly south of the natural area. The stand lacks any formalized trail system so access to the interior of the treed area is restricted. Despite this, there is ample opportunity to view the natural area and a variety of wildlife species from its edges. A willow-shrub community with marsh reed grass and swamp horsetails is present in an area of moist soils in the southeast portion of the stand that adds to the diversity of habitats found at this site. This site contains a diverse assemblage of birds including cedar waxwings, pileated woodpecker, western tanager, red-eyed vireo, and many others. There is also evidence of deer and other mammals frequenting the area. Combined with a diverse shrub layer throughout the stand, the diversity at this site and the habitats it provides for wildlife are among the stand’s key features. 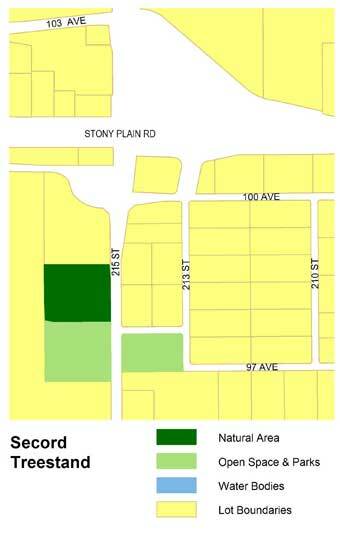 Located east of 220 Street, between 97A Avenue and 98 Avenue. It borders the west side of the Secord Treestand. 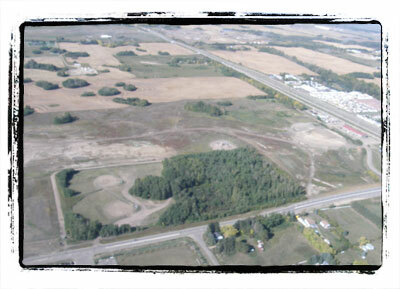 Located at Secord Boulevard and 217 Street.